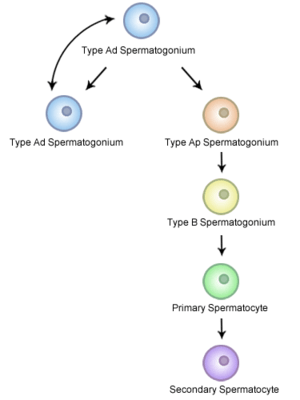 A spermatogonium (plural: spermatogonia) is an undifferentiated male germ cell. 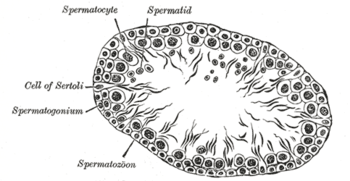 Spermatogonia undergo spermatogenesis to form mature spermatozoa in the seminiferous tubules of the testis. Type A (dark) cells, with dark nuclei. These cells are reserve spermatogonial stem cells which do not usually undergo active mitosis. Type A (pale) cells, with pale nuclei. These are the spermatogonial stem cells that undergo active mitosis. These cells divide to produce Type B cells. 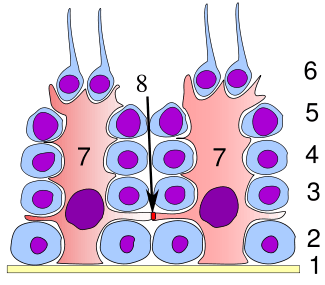 Type B cells, which divide to give rise to primary spermatocytes. ↑ Mahla, R.S. 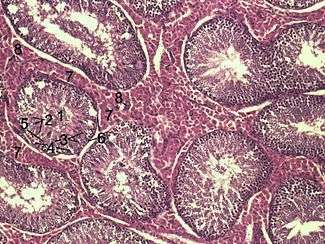 "Spermatogonial Stem Cells (SSCs) in Buffalo (Bubalus bubalis) Testis". PLOS ONE. doi:10.1371/journal.pone.0036020.